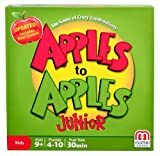 Apples to Apples is a party and comparison card game. The game consists of over 1000 cards divided into two decks of cards: red cards (nouns such as things, places, events or names of a person) and green cards (adjectives and descriptions). 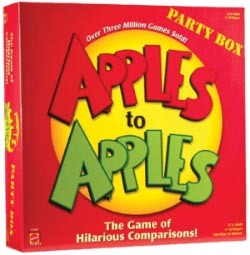 The goal is to play a red apple card from your hand to best match the communal green apple card and win the round. One player acts as a judge and decide what feels as the best match. 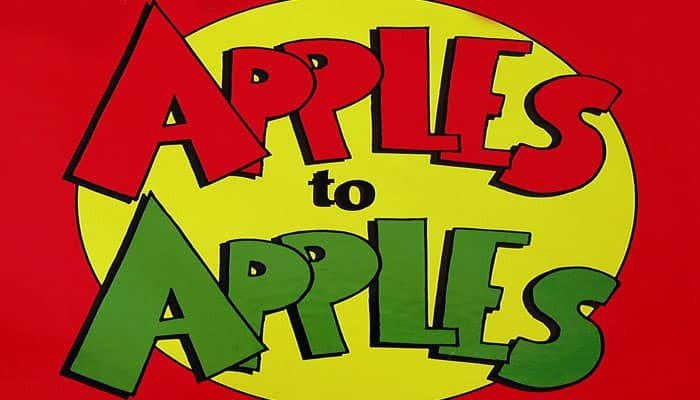 The winner collects the Green Apple and the role of judge passes to the next player. The game ends once a player has won a pre-determined number of green cards and that player is declared as winner. Red Apple Cards - 270 cards, each featuring the name of a person, place, thing or event. Green Apple Cards - 90 cards, each featuring a characteristic of a person, place, thing or event. 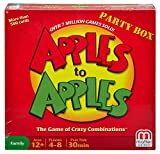 Open the red apple card packs and thoroughly mix all the red apple cards. Evenly distribute them between the two side-byside wells in the box bottom.